In his many proverbs about the virtues of wisdom and the value of living a wise and prudent life, King Solomon speaks frequently about the importance of “wise counsel” – learning from those with more knowledge and experience in order to act wisely and prosper: In the often-quoted Proverbs 1:7, the King tells us, “”Fools despise wisdom and instruction.” In real estate as in other areas of life, prudent planning and taking advantage of tried and true strategies can save grief and money later. With that in mind, real estate experts have compiled a list of key considerations for those preparing to take the plunge. For the same reasons, buying a property that already has good tenants in place trumps buying a currently vacant one. That saves expenditures related to cleaning and repairing a house to get it ready for tenants, and eliminates the vacancy period before they move in. Financial experts suggest taking a look at current tenants’ credit payment history as part of the decision to buy a property. And if the property itself is a winner, but the tenant isn’t, a prospective landlord may need to consider options for terminating or renegotiating lease agreements. 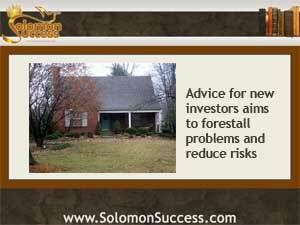 Boring properties may be less risky than those in highly desirable or flashy locations. A moderately priced house in a quiet neighborhood near schools and shopping may be easier to keep rented and maintained than a more exotic beachfront or resort area property with a high tenant turnover that may be more appropriate as a short-term rental.